Well, it's time for me to sign off after what has been a sensational day of cricket. There's going to be plenty more reaction over here and I'll be back in the morning. "I think if they could get these two (Amla and De Villiers) out reasonably early, there's enough players in that line-up that are not great players, that England could get them out. There's guys who are not in great form, and the tail end is poor. De Villiers can be cruel - we've seen him in one-day cricket, he can play like Ben Stokes. The first half of the day is crucial." What about tomorrow? England will have a second crack at South Africa, who still need 289 runs to avoid the follow on tomorrow. "Elgar played well - a nice big stride forward to the ball. He plays very straight, he drives the ball off the front of the bat. "Once you've done it in Test cricket, it only takes 20 or 30 runs. A batsman like Amla, who caresses it, he could easily get 200 tomorrow." England's Jonny Bairstow on Sky Sports: "It's the best day of my life. There's been ups and down along the way. It's not just special for me, but all the people who have helped me along the way. I'm over the moon. "It's a special day for all the family, both here and not here. "There's been lots of things over the last few years. My grandpa passed away last year and my dad's anniversary is coming up. "It's great to play Test cricket and to come out and score 150 in a new year's Test, it's the start of what will hopefully be a long career. "It was absolutely not a plan to play second fiddle to Ben, but he was going like a steam train. He was unbelievable and it was a special knock." Jonny's father David, who played four Tests for England and had a glittering Yorkshire career, died aged 46 on 5 January 1998. More from Ben Stokes: "People won't speak of Jonny's knock, but the way he played his natural game was amazing. "Jonny has worked really hard on how to play quick bowling. In the first Test he showed what form he is in. I'm buzzing for him. "I was conscious of getting out of the way when he got his first hundred. You want that 10 or 15 seconds all to your self. You want to salute your team-mates and the Barmy Army. "I let him have his moment then told him how proud I was of him." More from Ben Stokes: "It's nice when you get a flat wicket. You can hit through the line and you don't have to worry about your feet because I was just using my hands by the end of it. "Cookie sent a message out when we were on 600 saying '630, or do you want to go for 300?'. I said it didn't matter because I was just trying to hit every ball." More from Ben Stokes: "I wasn't intentionally going to play like that last night, I just got myself in on a good wicket. "Once the new ball came, it pinged off the bat a bit faster. "I was just trying to get the shine off it as quickly as possible." Former England captain Nasser Hussain on Sky Sports: "Class knock, absolutely class knock." England's Ben Stokes on Sky Sports: "I can't really believe what I did. It hasn't sunk in yet. It was just one of them days. Everything went my way. I don't really know how to explain it. "He who dares is probably the best way to describe it. "When I looked at the board, we had a lot runs and I thought we were in good position anyway. So I just tried to chance my arm because I thought me slogging one up in the air wouldn't hurt too much." "Bairstow's mature, he didn't try to compete with Stokes. Bairstow carried on playing, took his singles, played his shots when he could, and after he got 100 he played expressively." If you listen to Test Match Special now - you can do so via this page - they are replaying the highlights of that astonishing Ben Stokes innings. Former all-rounder Ian Botham, whose record for fastest England double century Stokes broke today, on Sky Sports: "The next three days he's not going to sleep. He's going to run in and bowl 100mph and dive through picket fences. You've got to make the most of it and enjoy it." "If anything South Africa got sucked in to bowling Stokes out. If they had played like a 50-over match they would have tried more yorkers. "I'm not blaming Amla this time - I don't think you could have done much. Stokes may have hit those one-day variations, it was just his day!" Could South Africa have done anything to stop Storm Stokes? Geoffrey doesn't think so. "Stokes doesn't bat the same style but remember Kapil Dev? He plays in that free uninhibited way. They are just cleanly hit. They sailed over the boundary by a long way. "Everybody that has come today will go home and say they've seen something really rare. Rare, special, enjoyable, memorable." The day was all about Ben Stokes, however, with the all-rounder adding to his batting exploits with the wicket of stubborn opener Dean Elgar. England, by the way, scored 312 runs in 39 overs with the bat today. Wow. "South Africa feel to be a team in decline but they have shown some steel." When South Africa were put out of their fielding misery, their day appeared to be going from bad to worse as opener Stiaan van Zyl fell to a run out with less than 10 on the board. However, Dean Elgar (44), Hashim Amla (64*) and AB De Villiers (25*) all batted sensibly to give South Africa a fighting chance. The hosts ended the day 141-2. "It was an extraordinary day, an extraordinary batting performance. Stokes teed off right from the first over. Amla opened with Morris and he seemed to fancy him from the off. Nobody saw this coming. We all know that Stokes is a rough diamond, a free spirit." At the other end, Jonny Bairstow played a fine supporting role and reached his maiden Test century after lunch before going through the gears himself. Jos Buttler will have to go some to get back into the side now. Bairstow finished with 150 not out, his innings only being ended when England declared on 629-6. "You felt he could hit it absolutely anywhere." As Geoffrey says, Stokes was smashing everything. It was like a closing down sale at a shop - everything had to go. And it did. Morne Morkel, with more than 200 Test wickets to his name, was bowling length balls and watching them disappear back over his head. It really was sensational stuff. "It's been a memorable day. That was phenomenal. You won't see many innings like Ben Stokes'. They are very special moments. "Jonny Bairstow played well at second fiddle, but some of the strokes by Stokes... he kept smashing the bowlers back over their head. "It was an outstanding innings - I'm very pleased for the young man - a marvellous performance." Ben Stokes started the day on 74 not out, but the best was yet to come. He plundered runs left, right and centre. Poor Chris Morris, on his debut, went for 81 runs in 57 balls. "It happened from the first over of the day, when Stokes smashed two fours. It gave us a sense of what was to come." Let's recap on what happened today then. To put it bluntly, Ben Stokes marmalised South Africa. It was raining fours and sixes as the all-rounder produced an innings as imposing as Table Mountain which overlooks Newlands. "It's been a remarkable, remarkable day for English cricket. It will stick long in the memory of everyone who saw it, particularly the thousands who have travelled over to Cape Town." Ben Stokes' heroics with the bat have taken even his former team-mates by surprise. The all-rounder's 258 off 198 balls was the fastest double century by an England player, and the second quickest of all time. But Geoff Minshaw, club secretary at Cockermouth in Cumbria, the club where Stokes played as a junior, told Press Association Sport: "We thought he could possibly make it as a county cricketer. "I don't think anybody would have thought he would go on and dominate the world stage. "He's got the potential to be the best all-rounder England have ever had and maybe the best all-rounder the world has ever seen." Forget Sunday, this was Stokesday. A sensational day of Test cricket ends with England 488 runs in front. Not bad, I suppose. "That's 453 runs in the day - a record for the most scored in a day of Test cricket in South Africa. It beats the 450 made by Australia at Wanderers in 1921." 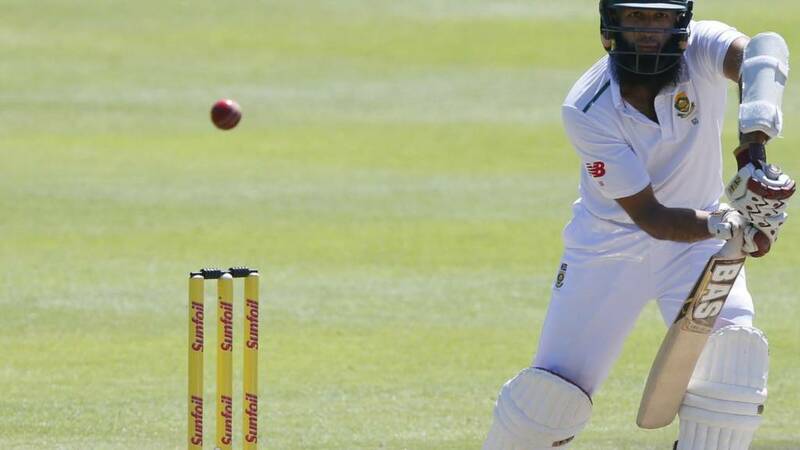 Hashim Amla sends South Africa in for the close with a smile on their faces following successive boundaries down the ground and one thick-edged through the gully region. Steven Finn delivers what is likely to be the penultimate over of the day (it looks like we might lose another 36 balls tonight). There's a muted appeal when AB De Villiers doesn't play a shot and the ball flicks off the top of his front pad. Not out... but something to think about. Probably not, Sparky, since Stuart Broad appears to have wrestled the ball from Ben Stokes. Broad always looks to be England's most skillful bowler and he gets one to reverse back into Hashim Amla and the batsman's confident leave looks a little ill-advised. Amla is soon back on top with a cut through backward point for four. Sparky McGhee: Can they have the perfect finish to a perfect day? B Stokes c Bairstow. Has there, by the way, ever been a better time to be ginger? Ben Stokes and Jonny Bairstow have struck a blow for the flame-haired brigade today... as this next piece of social media underlines. "Amla's last half-century was exactly a year ago today, against West Indies. He went 11 innings without a fifty, his longest run in Test cricket." There it is... an exquisite flick for four off his pads and Hashim Amla raises his bat for his first fifty in 11 Test innings. "If that had hit the stumps, he would have been out." Ben Stokes is ticking now. He tries to run out AB de Villiers with a strong throw, misses and the ball runs for four overthrows. Stuart Broad, who should have been backing up, gets a flea in his ear. Ever the competitor. Ian Dobson: Daniel Craig is apparently going to be auditioning to be the next Ben Stokes. A red-faced (sun, not embarrassment!) Ben Stokes is given one last chance to make his astounding day even better. He's getting bounce from the surface, which AB de Villiers rides and middles for two into the leg side. "On a surface like this you really have to hang on to your chances because you know how hard you have to work for each wicket." Joe Root dropped AB de Villiers on five at second slip. Hashim Amla is a tall, slender player who doesn't seem to have an ounce of fat on him. He stands tall at the crease and opens the face to try and work Moeen Ali through the off side. He picks out the fielder though. Just one from the over. "Hashim Amla went 21 balls without scoring a run before that two." James Anderson is playing a game of patience with AB de Villiers. He's hanging the ball outside off stump, has three slips in place and another three fielders in the ring on the off side. When the strike is rotated, an extra slip comes in for Hashim Amla. Who will blink first? Three from the over, the highlight being a firm push down the ground for two by Amla. "It hasn't been a good day for Hashim Amla but he can help to put things right with a solid batting performance, he can take a lot of pressure off himself." The crowd gets their apparent wish: Moeen will bowl to Hashim. Off-spin from round the wicket from the bowler and the batsman defends. We're bobbing along quietly to the close now. Josh Nagil: The Hashim/Moeen song at the South Africa v England game is infinitely better than the Kolo/Yaya song. Phil: Someone please stop that Hashim Amla song. The supporters are entertaining themselves by adapting a song about the Toure brothers and inserting the names of Hashim and Moeen. It's a song which appears to be on repeat. James Anderson delivers another maiden to Hashim Amla. Dan Dyer: Why is the England cricket badge on Moeen Ali's shirt red and everybody else's blue? AB de Villiers is scoring at a run a ball here, leaning into a bit of a pie from Steven Finn to plunder four through mid-wicket. "You would think the skipper would be thinking a bit more Ben Stokes before the end of play. The crowd will be boisterous and hoping he does something as he generally does." Can I start a campaign here and now to get people to wear ginger wigs at work tomorrow, in tribute to Ben Stokes and Jonny Bairstow. If you send in your pictures, we'll try and use some in the live text tomorrow. Hashim Amla, it has to be said, looks in superb form. He's leaving well outside off stump and defending with a steely determination. As skipper of the side, this match carries even great significance. Maiden over for James Anderson. "I'm feeling a little drained from having to give England so many compliments. The South African batting unit is not going to get a better chance to find form. It's a big afternoon for AB de Villiers." We're into the final hour of the day. One more wicket and England will be delighted, two more and it's party time. Steven Finn is hanging the ball outside off stump waiting for a mistake, which he almost induces when AB goes fishing. The batsman responds by driving a full ball back down the ground for four. Shot! "That was as straightforward a catch as you're going to get at second slip, his hands got in the wrong position." What a chance! AB de Villiers edges James Anderson to Joe Root at second slip and the grabber spills it. It was a bit of a Ronnie Rosenthal (a sitter), and runs away for four. As for Anderson, he's furious and aims a sledge in the direction of the batsman who wisely just smiles and nods. AB, I should add, always strikes me as a nice, laid-back fella. Jonathan Heward: Superman wears Ben Stokes pyjamas! Stuart Broad stands with his hands on his hips and blows bubbles from his gum. He'll be desperate to get a crack at AB de Villiers, who he's dismissed more than any other bowler in the world. For now, though, Steven Finn has the cherry in his hand. And I think he's got rid of Hashim Amla via a bottom edge which, bizarrely, England barely appealed for. If it was an edge, it was a tickle. But I think it was out. "I don't think Ben Stokes' day is done yet. You would think that the skipper will be thinking, just give him three or four overs at the end to make something happen. I wouldn't bet against Stokes having more of a say - as if he hadn't had enough already." AB de Villiers, like Ben Stokes, is more known for his big hitting. But he's also a master craftsman as he shows when he stands on his tiptoes and rides the bounces to ease James Anderson through the covers for three. For my money, the best batsman in the world if we take into account all formats. Closely followed by Kane Williamson, Steve Smith and Joe Root. Chris Brown: Find me a person who's having a better 2016 than Ben Stokes and I'll call them a liar. Butlins McCarthy: Stokes taking a wicket, about time he made a contribution to this game. Shannon McKee: I'll take full responsibility for that wicket, after just declaring on #bbccricket that Elgar was going nowhere! you're all Welcome! Shannon is right - we checked! It's unlikely we'll see an innings like Ben Stokes' again for a while, but if anyone can replicate it... AB de Villiers can. England know that if they can get rid of AB or Hashim Amla now, they are well on top. The latter has different ideas though as he caresses Stuart Broad to the cover boundary. Sublime placement. Liam Hegarty: Ben Stokes to play Bond apparently #gingerbond. "I'm amazed that it carried that far. Elgar tried to work it on to the on side but he closed the face. He gets to 44 but then makes that one error. It's a brilliant catch from Compton and it's that man again, Ben Stokes." I was just writing that the compact Dean Elgar is more organised at the crease than a Filofax and then Ben Stokes steps up to clear the left-hander's diary for the rest of the day. A short delivery with steep bounce takes the outside edge and Nick Compton does the rest with a good catch at backward point. "Alastair Cook has just got to swap things around. there's no magic wand on a good pitch. Keep the tactic - keep it outside off stump. If you get Amla wide, out of his comfort zone, you might just get him to nick it." The player to have dismissed Hashim Amla the most in his career? Mitchell Johnson. England might consider selecting Mark Footitt, their own left-arm quick, for the next Test if Hash goes big here. Another interesting stat is that Amla is yet to score a run in the 'V'. Elgar, in contrast, has scored 22 of his runs down the ground. "Cook took it very nicely at first slip, two hands above his head. Bairstow didn't even move." There are a few light-hearted chuckles from players on both sides when Ben Stokes bowls a wide which ends up in the hands of Alastair Cook at first slip. Steve Harmison-esque. England cricketers wore black armbands as a mark of respect on Sunday. The cause of his death has not been given. Jeremy Green, the first XI captain of Sussex league side Preston Nomads, said the news was "a massive shock". "We had a nickname for him which was BMH, 'Big Matt Hobden'. He was a larger-than-life guy on and off the field," said Green. Stuart Broad is trying every trick he's got up his sleeve... which is quite a few. Bowling with a wobbly seam, dishing up short stuff or delivering loopy, slower ball yorkers, he always looks a threat. But Hashim Amla has been around the block himself and pulls a bumper to the boundary. Ben Stokes gets a little taste of his own medicine when Dean Elgar punches him for four through the leg side. I wonder if Marlon Samuels saw the innings today? Surely it's worthy of another salute? Marlon... we're here if you want to pay tribute. Amanda Rutter: Is 629 suddenly looking like a rather slim total on this batting pitch? Karl Barrett: Looks like south Africa have made a flatter pitch to help their batsmen find some form. Alastair Cook is not allowing this game to meander in the way Hashim Amla did at the same time yesterday. He brings Stuart Broad back for a spell. Bowling round the wicket, Broad is too leggy to nuggety left-hander Dean Elgar and is nudged for ones and twos. "If you were a South Africa supporter you'd be fairly happy with how things are going. Elgar is getting his foot out to the ball and Amla is playing better, but he's got to be careful." James Thomas: Is there anywhere I can buy some Ben Stokes pyjamas? Age 43-44. Ben Stokes has already brought a crate of lager, a box of wine and a tray of vol-au-vents to this party... but perhaps he has more to give? He hurries Hashim Amla with a bouncer which the South Africa skipper is late on. A little appeal, no edge behind. Maiden over. "It's so good this pitch, Hashim Amla is just staying on the back foot and picking Moeen off with a stick of rhubarb." Thanks Justin, a good stint. It's all gone a bit quiet, hasn't it? Like the coach home from a school trip, or perhaps the night bus from town. Everyone and everything has been going at 100mph and now there's the inevitable slump. I'm sure that'll change once they chuck the ball to the cool kid at the back of the bus, Ben Stokes. One from Steven Finn's latest set of six. Amla may been in a bad run of form, but he's certainly looked accomplished today. He makes room to force Moeen through cover off the back foot for a couple as the off-spinner drops short before Elgar drives straight, his fifth boundary. And that's the 50 stand. Time for Marc Higginson to take the live text reins once more. "This is a tough pitch to bowl on. Like a chief executive's wicket." Finn is fuller to finish the over. Elgar is up to the task. "It looks like it's going to be difficult for England to prise them out. They might have scored a lot of runs, but the ball is doing nothing for them at the moment." Technically a chance but no blame attached to James Taylor there. Amla works Finn off his hips and Taylor does well to even get a hand to it low to his right at short leg. It would been a blinder. "Elgar is playing very nicely. He's carried on his good form from Durban, which is not always easy after you've been thrashed round the park." I'm yet to see one turn in this innings. Neither has Elgar, who casts aside his caution to dance down the track and deposit Moeen over the rope at long-on. He didn't quite get to the pitch but he kept his shape well and that was very sweetly struck. Patch Thompson: Ben Stokes is my new sporting icon. I'm going to do nothing but bicep curls and dye my hair in an attempt to become him. "Hash-im, Hash-im. Hash-im, Hash-im. Hash-im, Hash-im. Hash-im, Hash-im, Hash-iiim." Easily pleased, some fans. Two off that over from Finn. "Ben Stokes should get a bowl before long. When you've had such a great performance, it can be horses for courses. I'd be giving him three overs to see what he can do." Moeen to Amla. Beard to beard. Five dots followed by another whipped four off the legs by South Africa's skipper. "Dean Elgar is not looking all together on top of things here against Steven Finn." The Root Experiment lasted only one over. Elgar has Steven Finn to face instead - and watches a bounces whistle past his nose. He responds by twice driving fuller deliveries back past the bowler, before Finn counters with a sharp blow to the glove. "It is such a good pitch here. It has got that lovely bounce and a fast outfield, I'd like a bat on it." Moeen continues. Spin from both ends, on the second day of the match no less. Who'd have thought it? He strays on to Amla legs and, like so many bowlers before him, pays the price. "Amla is a popular figure but he has been struggling of late. There are many that would like to see a few hours of him batting. That triple century he got at The Oval in 2012, from the minute he walked to the middle he didn't look like getting out." Tidyish from Root. Amla collects a single and Elgar a couple. No alarms. "At the start after a break, get your big guns on. I hope Joe Root gets a wicket but it wouldn't be the normal thing." Cheeky from England: Joe Root gets the first ball of the evening with his part-time off-spin. Interesting. Very interesting. Who ever said Alastair Cook was a predictable captain...? The England players are in place, eager to get going again. Amla and Edgar are loitering on the edge of the boundary, slightly less keen. Let's do this. Jonny Bairstow's mum and sister reveal they are likely to head for a glass of champagne with their son/brother at the close tonight. Richly deserved. More from Jonny Bairstow's mum Janet on TMS: "He knew where we were and then when he got his hundred he turned round and pointed and that was a special moment. I usually get too nervous to watch, I just want him to do well like any mother would." Is this the cricket equivalent of 'Turtle power'? Jonny Bairstow's mum Janet on Test Match Special: "He's in a good place at the moment and enjoying his cricket. He has worked very hard and he deserves it." "That last boundary was a reminder that it is a good pitch and there are runs out there. Mentally South Africa just have to play the ball and stick to their game plan. The way that England have played can do funny things to the mind though." Elgar has been about as reluctant in attack as a sulky teenager is to leave his bedroom, but he choses the final ball of the session to unfurl a wonderfully straight checked drive. Let's have tea, shall we? "You generally know when a batsman reviews it straightaway it is not going to be out." Clear inside edge. The decision is overturned. As you were, gentleman. Maiden over. Moeen strikes! It's full, Elgar pushes forward, the ball strikes him on the pad, the finger is up! But wait - Elgar wants a review. No hesitation in asking. What are South Africa up to here? Almost another run-out as Elgar works Moeen to leg, thinks about a single. Panic over. And we have spin. Moeen Ali replaces Broad for a twirl before tea. "Amla is a popular figure but he has been struggling of late. There are many that would like to see a few hours of him batting. That triple century he got at The Oval, from the minute he walked to the middle he didn't look like getting out." Anderson in for his fourth over. England's premier bowler has four slips and a gully ready and waiting. Just a hint of outswing - no more than that - and Amla stands tall to force that through point for his first intentional boundary. Adam Taylor: I'm sure he's delighted by the score, but looking very difficult to see how Ian Bell could make a comeback. Jamie Williams: I'm being very English and starting to feel sorry for the South African's. Bloody Bishop: Dear England I'm working today and off next two days. Please have a heart save some excitement. Elgar, hunching over his bat like a student in a dimly lit library, is solid in defence to Broad. A maiden over. We have 10 minutes until tea. "It's mental disintegration what England have done to South Africa. There is no swing, it's a perfect batting day and Van Zyl will be back in the dressing room thinking 'why?'" Oooh! Almost another for England as Elgar, having eased Anderson through cover for two, sees an inside edge just evade his stumps. Amla then drives streakily wide of three expectant, hungry slips. Four to the total but nervous times all round. Jon Salinger: Why have England not bowled out South Africa yet? Neil Burns: Stokes should have been given the new ball! He is blessed by the gods of cricket today! Kristian Blade: Very impressive. But can they do it on a rainy Tuesday night in Stoke? Broad back over the wicket to the right-handed Amla. Having had his captaincy roundly lambasted for the past day and a half, Amla is now faced with leading the Proteas fightback against a rampant England. Good luck, Hash. "Amla is averaging just 15 in his last seven Tests." How can South Africa's day get any worse? Replying to a daunting 629, to lose one of your openers to a run-out in the third over is not far short of cricketing hara-kiri. Hashim Amla is the new man. "What did I say before the start? Their confidence is down, it's like a rolling stone, you can't stop it. Who would have forecast a run-out on a flat pitch like that. It's a gimme wicket for England." South Africa fans, look away now. No, seriously, this is horrific. Van Zyl dtrops the ball to the left of point and starts jogging down the pitch. Dean Elgar starts to go then says no. Nick Compton scampers and collects the ball and Van Zyl is well short. Sorry, sorry viewing for the hosts. Two left-handers opening up for South Africa - and Broad has clearly planned this round-the-wicket approach. Van Zyl collects a single off the final delivery. And it's Stuart Broad from the Wynberg End... Round the wicket to Van Zyl, who clips it off his pads for four. The chase is on. "There has not been much movement in the pitch. They just have to bat well and at some stage they have to get the gremlins out of their minds." A triumph! South Africans rejoice! The first over, bowled by James Anderson, is negotiated without alarm by opening pair Dean Elgar and Stiaan van Zyl. Two off the over. Trailing by 627. Sorry, couldn't help myself. Stokes 258: 198 balls, 30 fours, 11 sixes. Bairstow 150 not out: 191 balls, 18 fours, two sixes. "It is a good pitch. South Africa have to get it into their head to not play bad shots, make them bowl you out. It is not about plundering boundaries; it is about assessing what to leave and getting a steady start. Get a platform and move on." Some more figures for you, stats fans: in the course of that innings, Stokes' Test batting average has gone from 28 to 34, and Bairstow's from 28 to 33. "The 550-600 took only 22 balls. They took 15.1 overs to get from 300-400 and just 11 overs from 400-500." It's worth noting that Stokes and Bairstow added 399 for the sixth wicket - in only 58 overs - the highest sixth-wicket stand in Test history. Mightily impressive stuff. Cook clearly wants to give his bowlers a blast at this bedgraggled South Africa side. Who can blame him? The hosts have been pummelled today - 312 runs in 39 riotous overs. "I didn't see that coming - I thought they would go on a bit longer. I'm not sure that if you bowled South Africa out he would make them follow on because in the hot weather it is hard work for the bowlers." And with that, Alastair Cook waves Bairstow and new batsman Moeen Ali in. Interesting. Bairstow is on strike now - and he hoists Rabada for six next ball. A single takes him to his 150. Well batted. "If you're a real lover of cricket, even if you're a South African, you have to put your hand up and say 'I am glad I was there.'" There's no third time lucky. Stokes swipes, the balls comes down with snow on it, but AB de Villiers drops a steepler at mid-on... Hang on, Stokes was ambling down the pitch - De Villiers picks the ball up, spots him out of his crease and throws down the stumps. A rather ugly end to a remarkable innings. And another. Stokes goes big again. "Don't bowl there to me, young man." Rabada bangs it in once more, and Stokes pulls it disdainfully over mid-wicket for six. That's his 250 - the quickest in Test history. Four off the final four balls of the over and it's time for drinks. Actually, food - the sub fielders are trotting on to the field with plates of fruit, I think. "I'm afraid Morne Morkel is standing in front of the largest and most vocal contingent of the Barmy Army and he is not going to hear the end of that." It doesn't rain but it pours... Even when a chance comes, South Africa manage to drop it. Morne Morkel barely had to move at long-off but Jonny Bairstow survives. To make matters worse, the ball goes for four. Chris Morris, for what it's worth, is the unlucky bowler. Deary me. "A new sixth-wicket partnership record in Tests, 368, the third time in three years that has been broken." Carnage. Pure carnage. Bairstow makes room to squeeze a near yorker-length delivery from Rabada through cover. He then pulls one to fine leg for six with very quick hands, and takes England past 600 with another powerful stroke back past the bowler. Only Rabada's shin prevents another boundary. Metaphorically and physically painful now. "Just the 331 balls for that 350 partnership, with 40 fours and eight sixes." "I think umpire Aleem Dar might be calling for a helmet soon. South Africa looking at the ball, I wouldn't be surprised if it has been knocked out of shape." Bairstow joins in the fun. First he pulls Stiaan Van Zyl through mid-wicket, then hammers him back over his head - flat and oh so hard. And another! Not quite as straight this time but the result is the same. They're hitting the ball so hard the umpires have to check if it's gone out of shape. Ouch. Ouch. And ouch again. "When South Africa bat the top three are going to be so crucial to try and stave off this momentum England have. If they go two down quickly there would be flutters in that dressing room again." Stokes rubs South African noses in it by muscling four through mid-wicket - followed by another to a vacant third man. Power and placement in equal measure. Yes, that pitched a good few inches outside leg stump. Desperation springs to mind.